When we came home from San Diego, the grass in our yard had become... longish. I spied something bright red in the middle of it and went out to investigate. I found what appeared to big a long, skinny tongue growing out of the ground! 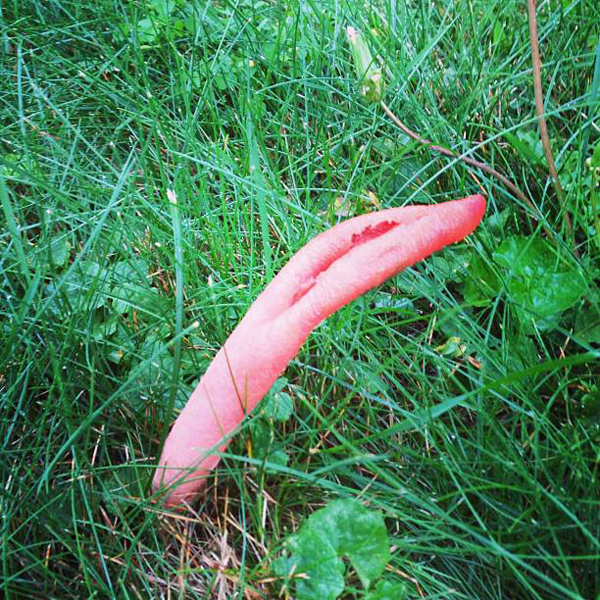 One instagram later asking what it was and I had my answer... a stink horn mushroom! The stink horn's scientific name is Phallaceae and it comes in many forms. Some are really crazy looking. Google it and you will see. 1 - Some part of the fruiting body, at some stage in development, is covered with a foul-smelling slime. 2 - The fruiting body arises from an "egg," traces of which may disappear by maturity."